Sometimes, a show losing the plot along the way still works out in the end. The Revisionist is in more tumultuous territory since...well, it didn't really have a plot to begin with. An epiphany occurred to me about two-thirds through the production...basically, I had no idea where it was going and what point was trying to be made. David, a New York-based writer visits his grandfather's cousin, Maria, in Poland to finish editing an overdue draft of his book. Connection happens! 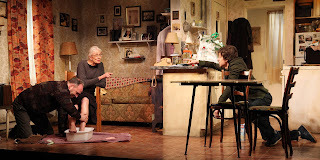 Thankfully, The Revisionist, written and starring Jesse Eisenberg now open at the Cherry Lane Theater, has more to offer on a character-building level (and obviously, that is where the "story" comes in). Maria, a Holocaust survivor who values a family she hasn't seen or heard from in years, is lonely and naive, with only a bizarre cab-driver friend and a phone call from David's grandfather once a week to look forward to. David couldn't care less about family or Maria for that matter - he just wants to escape, blaze up a joint and finish his next piece. It is the western-meets-eastern culture and younger-meets-older generation themes that collide head-on, garnering enough interest to make for a nice watch. Having seen Asuncion last year, Eisenberg's written debut also directed by Kip Fagan, I tend to think he has a unique point-of-view in the sense that he writes about topics with an "understanding and maturity for his age" perspective combining with his, admittedly cynical, take on the younger generation. Unfortunately, he often undermines all of that with his...moments of blatancy and self-loathing. David's assessment of Maria is correct - she hangs on to this conventional perception of her family that is clearly untrue, given they don't visit her or call her. The problem? David is a prick, so his opinion is harder to engage considering the audience hates him far more then they needed to. A softer hand with similar characterizations like that would make this study feel more seamless and relatable. But the dynamic between David and Maria is one of slow-building melancholia, culminating in a scene involving the two of them pounding vodka and Maria disclosing her harrowing past to David. Following suit, the show ends on a heart-breaking scene involving Maria's newfound perspective thanks to David's impact on her (and it also provided an alternative meaning to the show's title). In hindsight, I like those two scenes the more and more I think about them, if only because they felt like a suitable progression of the characters and a reward for the audience watching them. 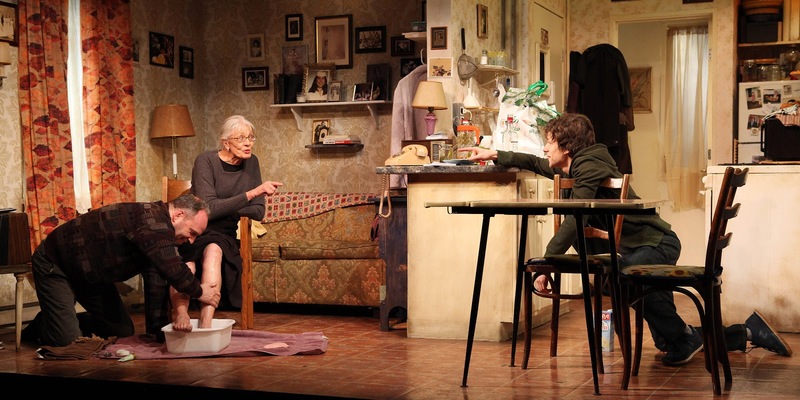 It's also worth pointing out that Vanessa Redgrave, as usual, is a delight in the role of Maria. Her affectations and Polish accent are on-point (as far as I can tell), but what she really nailed was Maria's duality - her strong, confident, "I lived through the Holocaust beotch!" side with her "isolation and longing for company; I feel despair" side. With a character who conveys so much about herself through subtle shifts of voice and movement, it's Redgrave offering up a masterful performance. And somewhat surprisingly, the girl knows how to WERQ a site gag for all its worth, in a show chock full of them. Most notably, her cab-driving friend shaves her legs in one scene (don't ask), and the hysterics that ensue had me roaring in my seat. The Revisionist may want you to grab a red pen and go to town on some parts, but you'll be too busy to even notice amidst the fulfilling relationship between the central characters. And similar to my reaction to Asuncion, I remain impressed with Eisenberg's knack for writing and look forward to his next piece, remaining hopeful his output can be further refined. Ticket provided by the press agent.